Archives are non-current records of individuals, groups, institutions, and governments that contain information of enduring value. Archival repositories select, preserve and make available these records. What will I find in the Hogan Jazz Archive? The Hogan Jazz Archive is a renowned center for New Orleans jazz research. The collection includes oral histories, recorded music, photographs, films, manuscript collections, sheet music and orchestrations. It also maintains files of clippings and bibliographic references; books and periodicals; and discographies and encyclopedias. 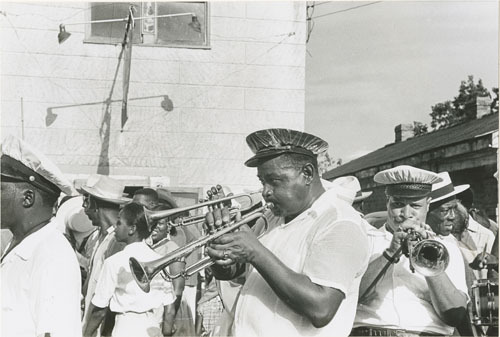 This guide provides a general overview of our collections and other helpful research resources for the study of jazz and the musical culture of New Orleans. Please contact us with questions via email at jazz@tulane.edu, by phone at (504) 865-5688 or in person in room 304, Jones Hall. We are open to the public Monday through Friday, 9am-5pm. Appointments are highly recommended, but not required. Click on the blue tabs to navigate the guide.